(Kitco News) – World stock markets were mixed and uneventful so far Thursday. U.S. stock indexes are set to open the New York day session narrowly mixed. The world marketplace is awaiting the conclusion of the European Central Bank's regular monetary policy meeting Thursday. No change in monetary policy is expected at today's meeting. As usual, focus will be on ECB President Mario Draghi's press conference after the meeting. U.K. Prime Minister Theresa May delivers a speech in Davos, Switzerland Thursday. Traders and investors want to see if she makes any remarks on the pace of the U.K.'s exit from the European Union (Brexit). The world marketplace is a bit anxious as Donald Trump is set to be inaugurated as the next U.S. president in just over 24 hours. Trump's stated ambitious economic growth plans have so far lacked specifics, which is worrisome to many market watchers. Trump has also made remarks that have ruffled the feathers of top Chinese government officials. China is the world's second-largest economy. 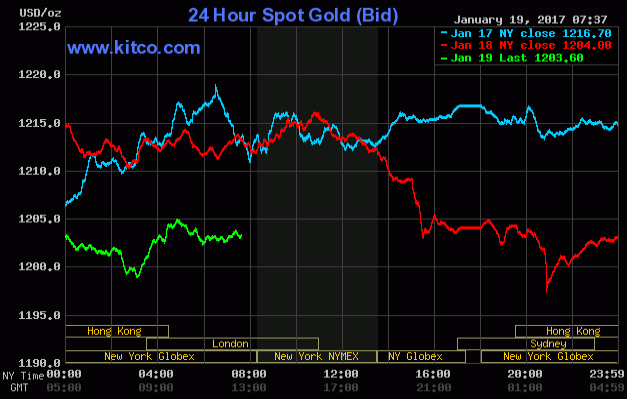 Gold prices on Thursday morning are seeing selling pressure from a firmer U.S. dollar index and on some profit taking in the yellow metal following recent good gains. The U.S. dollar index is seeing more of a corrective bounce Thursday following sharp losses on Tuesday that saw the index hit a four-week low. Fed Chair Janet Yellen in a speech Wednesday sounded hawkish, saying the Federal Reserve is likely to raise U.S. interest rates a few times in the next couple years, to ward off inflationary price pressures. This helped to boost the dollar index and put some downside pressure on gold. The other key "outside market" on Thursday sees Nymex crude oil prices trading higher. The International Energy Agency reported Thursday that OPEC appears to be cutting back its collective production, as it said it would do. There remain stiff technical chart resistance layers that lie just above the crude oil market. U.S. economic data due for release Thursday includes the weekly jobless claims report, new residential construction, the Philadelphia Fed business survey, and the weekly DOE liquid energy stocks report. Fed Chair Janet Yellen gives another speech in California later today.